If you don't see your question here, contact us at museum@wilmette.com, or phone 847-853-7666. Do you have anything about my house? We might! We don’t have a file on every house in the Village, but over the years we’ve worked to gather local real estate documents, news clippings, photographs, permits, plats, and other records that might include some information your house. If you give us an address, we can tell you pretty quickly from our index if we have any materials of interest and what they might be. Another place you can find information about the history of your house (and the property it sits on) is the Cook County Recorder of Deeds. To help you make the best use of your time at that office, we have written up a short guide to researching your house at the Recorder of Deeds. Do you have blueprints or floor plans for my house? We do have a few of these, mostly from local architects. However, unless the original owner kept them and they were passed from owner to owner, such drawings rarely survive. Can you tell me the name of the architect who built my house? If your house was built after 1920, the Community Development Department in the Wilmette Village Hall will have the building permit, which usually lists the architect as well as the builder. The Museum has files about well-known architects who were active here, so if your house was built by one of these, we may have more information. If your house was built before 1920, the documentation is much more hit-and-miss, but we can certainly check our files for you. How can I find out about the people who lived in my house? The old Wilmette street directories in the Museum's collection are a great place to begin looking for information about the lives lived in your Wilmette house. Some years (1917-18, 1922-23, 1925, and 1935) have a “reversed” section that allows you to look up the address and see who lived there. We have created reversed versions of the directories for 1890, 1898, 1908 and 1946; all of these are searchable online. Once you have put together some names, our biographical reference materials may be able to fill in more information. What is the Wilmette Century Home Plaques program? Wilmette had over 2,000 residences 100 years ago and most of those homes are still a part of our community. The Wilmette Historical Society (WHS) is offering homeowners an opportunity to purchase and display a beautifulplaque indicating the age of any homes over a century old. The plaque measures 7 inches by 10 inches, is made of brass and designed for display outdoors near the entrance of the home. WHS will assist homeowners in determining the approximate age of their home for display on the plaque. The cost of the plaque will be $185 for WHS members and $200 for non-members, which covers the production and shipping of the plaque from the vendor. If you are interested in purchasing such a plaque, please contact the museum at museum@wilmette.com or (847) 853-7666. A museum representative will contact you to assist you in dating your house and in arranging for your purchase. How do I go about having my historic house designated a Local Landmark? How do I find historic photos (of my house, street, family, etc.)? The Museum has a catalog of our photos that can be searched by keyword. When you visit the Research Room, you can browse through copies of photos organized by last name or subject. There are also photos of houses in the real estate files. How can I obtain copies of photographs? If you’d like just a photocopy printout of a photo for your reference, we can make that for you at no charge. For something more permanent and displayable, we can have an archive-quality print made for you for a modest fee, payable in advance: see our price list and Photo Agreement form. These make wonderful gifts, too. Can you just scan the photo and email it to me? No. Like other museums, WHM has to keep close watch over the materials in its collections and how they are used, and this precludes us from sending out digital copies of our photos except for licensed publication in magazines and books. 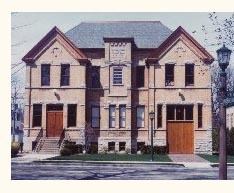 My ancestor(s) lived in the Wilmette area. How can I find out about them? The first place we’ll check is our Biographical File in the Research Room. Our Vital Records Index, which includes, birth, death, and marriage records, is available online; the original documents listed in these indices are also in our Research Room. How can I get a copy of a death certificate, for example? If you are from out of town, send a check for $5 and a self-addressed stamped envelope to Wilmette Historical Museum, 609 Ridge Road, Wilmette, IL 60091, and we’ll be glad to send you a copy. If you visit us we can make copies for you here.